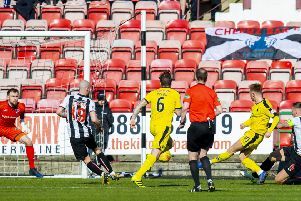 Ryan Blair’s late goal denied St Mirren a winning farewell to the Championship, but Buddies boss Jack Ross refused to dwell on an anti-climactic end to an outstanding season. The Paisley club has won just one of its last five games – yesterday’s defeat was their second loss to Falkirk in 11 days – yet Saints still finished 12 points clear of runners-up Livingston, and Ross is already planning ahead. Bairns manager Paul Hartley is in a similar position to Ross a year ago, having avoided relegation thanks to a storming run since Christmas. .
“It was a nice way to sign off,” said Hartley. “We wanted to sign off with a win in front of our home crowd. It was a sweet strike from Ryan.